Any episode short of one in which the giant sandworms from Tremors invade Dillon would have to be less intense than last week’s. (And thankfully, that seems unlikely to happen unless Comcast’s purchase of NBC leads to some kind of NBC/101 Network/SyFy synergy next season.) But that doesn’t mean this wasn’t still an eventful week, albeit in a quieter way. On the field, the Lions made some progress. Off the field, most everyone engaged in a series of retreats. The football story lends itself to easy summary: Vince and Luke, in addition to becoming friendly off the field, have developed some chemistry on it. The Lions put in a respectable showing—a near-victory, even—thanks to some quick-footed playing. And, it should be noted, some practice help from the Riggins boys. And show sponsor Sears, which is apparently willing to let football players hang out and watch game tapes if they like. That’s not the most graceful example of product integration, but it does allow Russell DeGrazier’s Coach Stan a nice moment standing up for his players against some J.D. McCoy bullying. 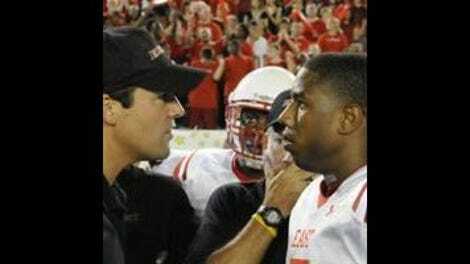 Whatever faults he has as a coach—including not knowing when to keep his mouth shut—he’s nothing if not fiercely loyal. Elsewhere, we’re given a few more suggestions about Vince and Jess’s past history and, perhaps not coincidentally, Landry learns that even a respectable showing on the field doesn’t mean he can begin a relationship with Jess with ill-defined terms. That scene, if I’m not mistaken, is the first reference we’ve gotten this to Tyra, the girl “embedded” in the back of Landry’s mind. It also connects thematically with the rest of the episode, as well, which is filled with unrequited new love—Becky pining for Riggins, Luke’s attraction to Becky—and old loves beginning to flicker. The Tim/Lyla relationship has never held that great an interest for me. Which is not to say that I thought it didn’t work. It’s just always felt like it needed a little more prodding from the writers to stay interesting than any other of the show’s major relationships. That’s also nothing against Minka Kelly or Taylor Kitsch, both of whom—Kitsch especially—grew as actors with virtually each episode during FNL’s previous season. The writers gave them storylines in which they seemed to break up and get back together for little other reason than they needed something to do and the pair played them well. I enjoyed the Tim/Lyla pairing best last season, when it seemed to settle into a comfortable, companionable groove with melancholy undertones created by Lyla’s inevitable departure from Dillon. This week gave that season a bittersweet epilogue, giving Lyla back to Tim for a few days, but only a few days. He professes not to mind saying, “I don’t if you know this but I’m kind of a moment to moment guy.” Yet by the end of the visit he’s trying to sell her on a future working for Riggins Rigs. The pitch seems a little half-hearted. He knows she has to go and, looking at him sprawled out in the back of his trailer, she knows he’s unlikely to leave unless forced. He’s a Dillon guy. They don’t move on. Though no less a product of Dillon, Matt, on the other hand, has never seemed as at home there. In fact, he’s never really seemed at home anywhere. A quiet guy with an artistic bent, he has enough talent on the football field to do some damage but not enough to take him any further than a high school championship. Even assuming the position of QB One kept with a pattern of deferring to the needs of the situation rather than his own desires. Duty called, just as it called for him to take care of his grandmother. And, just like before, Matt answered. With his grandmother now given a $100,000 death gratuity for her son’s passing and his mom’s assumption of homemaking roles, he can now see an exit sign. Only it’s blocked by the one element in his life he’s chosen for himself and held onto despite adversity: His relationship with Julie. 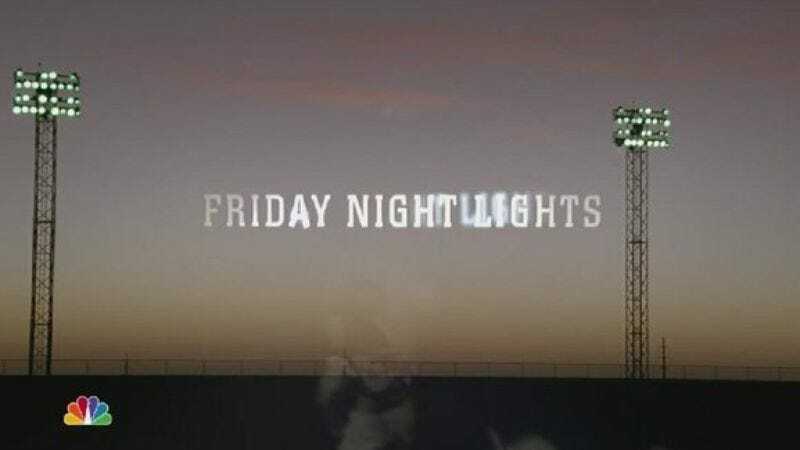 Friday Night Lights has always handled this relationship beautifully and here, at its probable end, they don’t make any exceptions. The Matt/Julie scenes rhyme nicely with Tim and Lyla’s, the foregone conclusion of the latter’s brief encounter making Matt and Julie’s Austin weekend seem that much more melancholy. If neither knows it’s the end of their time as a couple going into their trip to the SXSW-inspired Austin Music Festival, neither harbors any illusions at the end, even if neither will say it out loud. When Julie comes home, crying, she finds Tami ready to chastise her like a mother scolding a child. But the elder Taylor quickly recognizes that her daughter is now a woman with a broken heart. I probably shouldn’t speak of Matt and Julie in the past tense yet. Speaking to the L.A. Times, Gilford sounds as if he’s said goodbye to the character, but it’s a little ambiguous. He’ll definitely be back for, again per the L.A. Times, “two brief appearances” this season with any fifth season appearances left an open question. Of all the characters who’ve departed since last season began, he’s my Scarecrow: I’ll miss him most of all. Gilford’s quietly soulful performance has long been the heart of the show, and his character has captured everything great and frustrating about carrying all the virtues of growing up in a small town in your heart while aching to leave it for the bigger world promised you by Dylan songs. Gilford’s handled the role with understatement and nuance, and he’s never been better than in the last couple of weeks when Matt’s been forced to deal with his father’s death. He is, of course, still dealing with it. Under other circumstances, Matt would never leave Dillon without saying goodbye to his family and friends. But these aren’t other circumstances. In the end, leaving Dillon might be just another action he took while feeling he had no other choice. • I didn’t even get to mention how awesome Connie Britton and Kyle Chandler were in their scenes together this week. Do I need to? Because they were. • True fact: A friend of mine used to work the merch table at Heartless Bastards show. Sorry to throw my big-time show business connections around.